Beaver-Visitec and Sharpoint brand disposable stab knife tips that screw into handles, handles not included. Blue in color with 15-degree angled tips. Sold 6 per box. 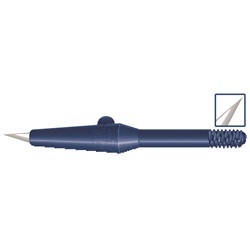 Disposable 3.0mm restricted blade depth. Sharpoint stab knives are heat-tempered to provide a strong, true point for easy penetration during initial stab incisions. 3.0mm straight restricted blade depth. Sharpoint stab knives are heat-tempered to provide a strong, true point for easy penetration during initial stab incisions. Straight blade.